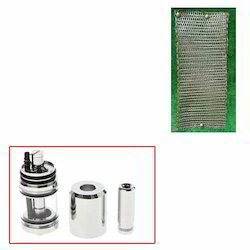 Our range of products include ss knit mesh for atomizer. With the valuable assistance of skilled team of experts, we are offering premium quality SS Knit Mesh for Atomizer. This mesh is manufactured using best quality basic materials and the latest machines under the observation of our deft professionals. Our offered mesh is used in diverse industries for screening purpose. Apart from this, we stringently examine this mesh on respective parameters in order to ensure best outcome. Looking for SS Knit Mesh for Atomizer ?